What thermostat wire color is likely to go to which terminal on the thermostat. The function of each wire terminal on the average thermostat. Additionally highlighting some of the differences in those functions from manufacturer to manufacturer. Sometimes the thermostat is not the problem. Therefore please check this article for a checklist of things to check before calling a heating and cooling repair service. You will always want to follow the thermostat manufacturer’s instructions whenever changing the thermostat. Always turn the power off!You can do this at the air handler and condenser. Always make sure there is no voltage at the transformer before proceeding. The thermostat wire colors below are the most likely colors used for most installations. However, your thermostat wire colors may be different than what is indicated here. There is no official standard for thermostat wire colors. You can consider this the standard wiring colors for thermostat and HVAC equipment. Standards for thermostat wiring colors do not exist except for here and a few other references on the internet. However, these are the most common wiring methods used. This is based on my years of experience in the HVAC field where I successfully wired many thermostats. For instructions and great tips on how to wire a thermostat please see our how to wire a thermostat page. Turn the power off before proceeding! Always follow safety instructions especially with electricity. This should be done at the circuit breaker for both the condenser and the air handler/furnace. The power for the condenser and air handler is done at the circuit breaker box or the equipment itself. The 24 volt power comes from a low voltage transformer in the air handler and in some cases the condenser. It is possible you could cause a dead short in the control circuit and blow the transformer. That could potentially cost you a service call for thermostat troubleshooting and repair. Always make sure you have the right tools and materials for the job. It makes things go so much easier. R – The R terminal is the power. This is a red wire and comes from the transformer usually located in the air handler for split systems but you may find the transformer in the condensing unit. For this reason, it is a good idea to kill the power at the condenser and the air handler before changing or working on the wiring at the tstat. If you have a package unit then the transformer is in the package unit. Red Wire for the R terminal. *Although be aware that this may have changed especially if the person who wired the thermostat didn’t use conventional color coding. RC – The RC terminal is designated for the power for cooling. Some HVAC systems use two transformers. A transformer for cooling and a transformer for heating. In this case, the power from the transformer in the air conditioning system would go to the thermostat terminal. It should be noted that a jumper can be installed between RC and RH for a heating and cooling system equipped with a single transformer. Red Wire for RC terminal. *Although be aware that this may have changed especially if the person who wired the thermostat didn’t use conventional color coding. RH – The RH terminal is designated for the power for heating. See RC above for an explanation. It should be noted that a jumper can be installed between RC and RH. This is only for heating and cooling systems equipped with a single transformer. Red Wire for RH terminal. *Although be aware that this may have changed especially if the person who wired the thermostat didn’t use conventional color coding. Y – This is the terminal for cooling or air conditioning and goes to the compressor relay. Typically a thermostat wire pull is made to the air handler on split systems. This wire is then spliced for the separate wire pull which is made to the condenser. Some manufacturers put a terminal board strip near the control board in the air handler. Therefore, a splice is not needed. Yellow Wire for Y Terminal. *Although be aware that this may have changed especially if the person who wired the thermostat didn’t use conventional color coding. Y2 – This is the terminal for cooling second stage if your system is so equipped. Many systems only have a single compressor but if you have two compressors (or a two stage compressor) which should only operate off of one thermostat then you need the Y2 thermostat terminal for second stage cooling. *The most common color I’ve seen used for this terminal and wire designation is light blue but this varies and is completely up to the installer what color to use. For the thermostat wiring colors code for this terminal (if equipped) consult with the installer. If that is not possible then trace the wire out to the source. W – This is the terminal for heating. This wire should go directly to the heating source whether it be a gas or oil furnace, electric furnace, or boiler or auxiliary heating for a heat pump. White Wire for W Terminal. *Although be aware that this may have changed especially if the person who wired the thermostat didn’t use conventional color coding. W2 – This is the terminal used for second stage heat. There are gas furnaces with low fire and high fire and some depend on control from a two-stage heating thermostat with a W2 terminal. Heat Pumps use staging for auxiliary heat and need a W2 terminal. *The most common color I’ve seen used for this terminal and wire designation is a brown wire but this varies and is completely up to the installer what color to use. For the thermostat wiring colors code for this terminal (if equipped) consult with the installer or trace the wire out to the source. G – This is the terminal used for the fan relay to energize the indoor blower fan. On a split system the blower fan is in the air handler. A package unit the blower fan is in the outdoor package unit. Green Wire for G Terminal. The fan wire. *Although be aware that this may have changed especially if the person who wired the thermostat didn’t use conventional color coding. C – This is the terminal which originates from the transformer and is necessary to complete the 24 volts power circuit in the thermostat but only if the thermostat consumes electricity for power. Many digital thermostats require 24 volts for power so the common wire is necessary. C stands for common and there is no universal color used for this terminal although black is the most common color I’ve seen. For the thermostat wiring colors code for this terminal (if equipped) consult with the installer. If that is not possible then trace the wire out to the source. O or B – These terminals are for heat pumps and the B tstat terminal is used on for Rheem or Ruud and any manufacturer that energizes the reversing valve in heating mode for the heat pump. Other manufacturers of heat pumps utilize the reversing valve for cooling. The O thermostat terminal will be utilized for this purpose. This wire goes to outside heat pump condenser where the reversing valve is located. This is for heat pump thermostats. Orange Wire for O and Dark Blue Wire for B depending on the installer of the heat pump and the manufacturer. If you have a Trane, Carrier, Goodman, Lennox, Ducane, Heil, Fedders, Amana, Janitrol, or any other manufacturer other than Rheem or Ruud you will be utilizing the orange wire for reversing valve. Rheem and Ruud will usually utilize the blue wire for reversing valve. E – This terminal is for heat pumps and stands for Emergency Heating. If for whatever reason the heat pump condenser fails and it is necessary to run the heat there is an option on heat pump thermostats for emergency heating. Basically, this simply utilizes the back-up heat source many heat pumps have to heat the home without sending a signal to the condenser to run for heat. E – There is no universal color used for this terminal designation but this should be wired directly to the heating relay or the E terminal on a terminal strip board in the air handler or package unit if you have a heat pump package unit. X or Aux – This terminal is for back-up on a heat pump and allows for auxiliary heating from the back-up heat source usually located in the air handler. X or Aux – There is no universal color used for this terminal designation but this should be wired directly to the heating relay or the Aux terminal on a terminal strip board in the air handler or package unit if you have a heat pump package unit. S1 & S2 or (Outdoor 1 and Outdoor 2) – Some tstats have this terminal. It used for an outdoor temperature sensor. Special shielded wire is used for this run and completely separate form the other thermostat wires. Some manufacturers will show this the T terminals on their thermostat. Using shielded wire prevents electromagnetic forces generated from other wires from interfering with the signal inside the shielded wire. A remote temperature sensor is a solid state device. The signal needed to get an accurate temperature is sensitive to electromagnetic forces from other wiring inside the structure. This type of wire is different from the typical thermostat wire and a separate wire altogether. If you find the colors are not matching to the convention described here you can always trace to the source. Most of all, only if you are confident in your skills. Remember, the wires that run from the thermostat are terminated in the HVAC equipment. Most noteworthy, air handlers, boilers, or other equipment have high voltage. Some manufacturers provide terminal strip boards. While in other equipment you will simply find a bundle of wires with wire nuts holding them together. In either case, it is important to find the wiring diagram for the unit. In doing so, you can match up the appropriate wire color from the thermostat to the termination in the equipment. The red wire should always come from the hot side of the 24-volt transformer. Consequently, the common wire (sometimes black in color) should come from the common side of the transformer. Most noteworthy, the wire colors on the transformer will be different than the thermostat wires. If you do not know what you are doing then please call a professional for a few reasons; as mentioned there is high voltage in the equipment and can be hazardous to your health. Therefore, if you wire it wrong or accidentally touch the wrong wires together you can blow the low voltage transformer. If you have extra unused wires left over do not cut them off. Wrap the wires around the bundle for possible future use. If perchance, in future thermostat troubleshooting, one of the wires you are using is found to be bad for some reason, you will have a spare unused wire to take its place. This will save you from pulling a new bundle of thermostat wire. Use our menu to the right to find helpful articles such as thermostat wiring diagrams, low voltage circuits for HVAC, how to wire an air conditioner for control, control board troubleshooting, and thermostat troubleshooting. You may also want to check our thermostat category for other detailed articles on thermostats. The category includes other detailed pages about thermostat wiring. I really like the descriptions on this page, especially the “Y” designation. Rushing through the first installation of our thermostat, a 4 wire system, I hooked the blue wire to “B”…which was incorrect. Heat would work but not shut off, A/C wouldn’t engage, but the central fan would. I had to trace back from the furnace to find that the Yellow went to white out to the return, then red back into the house, then finally to a blue wire…which needed connected to the Y post 🙂 9 month pregnant wife wasn’t so happy with the landlord for not getting out here to check what we thought was a stuck relay 🙂 Thanks for posting this!!! Oh, and check your main wiring schematic before hiring someone to hook up your thermostat. it is possible you have a problem with your heating system. Best to call for HVAC service. Hi, As a handyman, I change thermostats to the new ones regularly. However, I just came upon a Carrier system that has a thermostat with A,B,C,D,S1 & S2 as the wiring designations at the thermostat as well as at the heater itself. Can you possible tell me how these relate to the normal designations? It looks like this is one of those smart home thermostats with the automated home. Can’t say about any of those designations except the S1 and S2 (used for a remote temperature sensor typically an outside air temperature sensor). We are so happy you found out that information for us. I have always known these Smart Automated electronics in these newer homes are proprietary which makes things difficult if there is no technical support, available technicians, or even if the manufacturer goes out of business. It often leaves the homeowner/property owner with no decent or cost efficient alternatives. What seemed like a good idea when they purchased the home, with all the gadgets and technology, ended up costing them more money in the long run. Thank you for your diligence in looking this up George. You are a stand up guy!!! And there is a way to convert the home over to a normal home you just have to be able to identify the proper designations and know what it controls. I am trying to put in a new thermostat. I just bought my first home and I would like to use a new smart thermostat. However when I took it off the wall there were wires for A (green wire),B (yellow wire),C (white wire),D (red wire). I returned the nest i bought because it read an error of High voltage. I do have gas heating. Does anyone know of a Smart Thermostat that would be compatible? Not sure without knowing what type of system you have. Please see the article below and get back to us. You can also upload your photos using our uploader page. See the menu on the right. I have a question about my own new HVAC system which is using too much propane, in my opinion. My system is a Nordyne Heat Pump with a 93& efficiency propane furnace as the Aux Heat. No toasters installed. When the temp outside goes below 30, the Aux Heat is on as well as when the Heat Pump is in defrost mode, the Aux Heat is on. My question is can I install an SPST switch next the to the thermostat that interrupts the Aux wire so that I can control when the Aux heat comes on? And, can I change the settings so that the Aux Heat comes on below 20 instead of 30? You can certainly do that. I have done it on my own system in a different way although 20 degrees seems to be a bit cold. And I only recommend someone who really knows controls and wiring controls do this. No there should not be any continuity between any of the wires. To do a proper continuity test all wires should be disconnected between the equipment and the thermostat. Provided none of the wires are touching you should get infinity on all colors. If you do not then you definitely have a problem with the thermostat wire. Most likely it is old wire and the insulation has worn off and the copper is touching from one color to the next or someone drove a nail in the wall and hit the thermostat wire creating a connection where the nail is. Thanks Richard, i’ll isolate all conductors and see if it clears, right now the only thing i can get the thermostat to operate is the is the aux heat on the air handling unit which is driving my power bill through the roof !! i can manually push in the contactor on the heat pump and it will run, so it’s obviuosly not getting the 24 volts to the coil, my initial problem started with the low voltage fuse fuse blowing and i had to bypass it in order for the relays to pull in for the aux heat so i dont know if it is a motherboard prob or thermostat, there are no nails through the wire as i can see the wires to all units…any other ideas ?? beyond that and without looking at it myself I cannot offer you any other suggestions. I bought my first home 8 years ago from a little old lady who had lived in the home since it was built (1966). The kids/Realtor said they had finally installed a new A/C the previous summer and were really excited about it (they hadn’t removed the swamp cooler, yet, and the A/C compressor outside looked well-worn, so old A/C may have gone out years earlier – swamp cooler looked newer than compressor). Trane A/C system is attached to Bryant gas heating system. Thermostat was new, but a non-programmable digital. Recently bought a smart thermostat, and found the installer used an Add-a-Wire system to change the 2-wire in the wall to a 4-wire on the Trane A/C system. There’s a jumper between RC & RH on the old thermostat and another jumper between G and Y on the control board, with the Add-a-Wire system inserted in between (diode at t-stat, box mounted next to control board). I’m running new 5-wire line today to replace the old 2-wire/Add-a-Wire setup. Can I simply match new wire colors from unit to new t-stat and remove Add-a-Wire setup? What about the control board & t-stat jumpers – can those be removed, too, since the newly-run wires will cover all 5 spots on the control board (G, Com24V, W, Y, R) and will have their own terminals on the new smart t-stat? Thanks! the jumper at the t-stat should remain if you have an RC/RH terminal on the new thermostat. 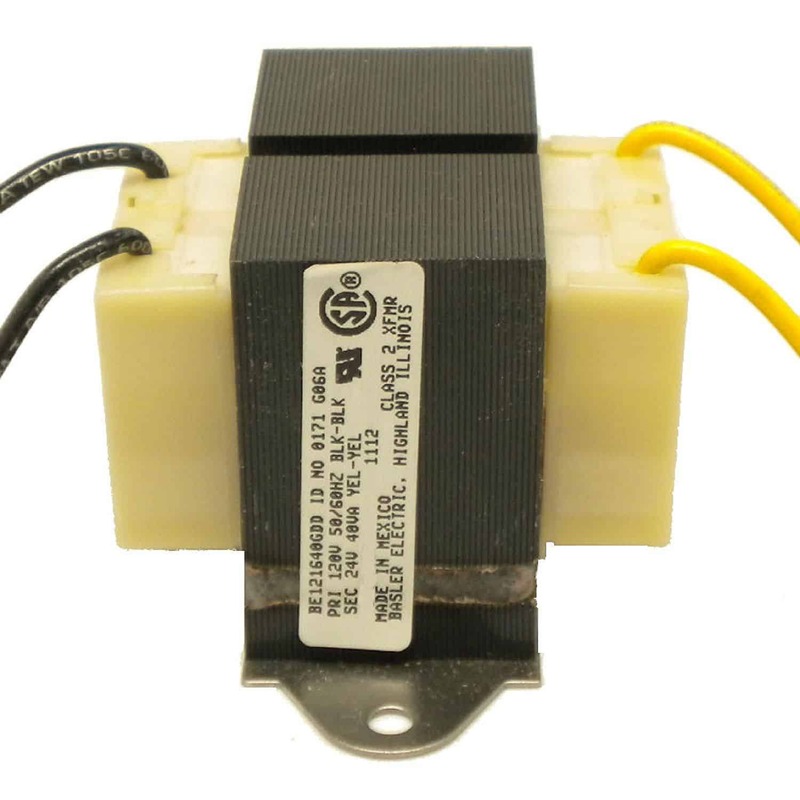 RC/RH are the 24 volt hot terminals for systems with separate transformers or control power supplies. From what you are describing your system only has one 24 volt power source or one single transformer for both the heat and the cooling. It is likely you have a simple R terminal at the thermostat and that is where the red wire should be terminated. The jumper at the control board can be removed from G to Y. That would simply make the blower come on at the same time as the cooling whereas this will now be controlled from the thermostat and you should see a little efficiency in the system from that change. Everything else is correct as you describe it. Good luck! Thanks so much for your help! I ran new all wire between t-stat and furnace & removed old wiring & Add-a-Wire setup from control board. Matched all terminals on board to terminals on t-stat with jumper between RC and RH on t-stat. Works beautifully, thanks so much! Now I just need to find a new forum to get insight on installing new ducts (I’m finishing my basement myself – lots of remodeling experience as a teenager), possible zoning of existing system (separate upstairs & downstairs), and possible whole house fan to move cold basement air upstairs during Summer, and warm air down to basement in Winter (rambler style house). I just want to collect information before I have a professional come and try to overcharge me or give me wrong information – as a single woman, I get that a lot, unfortunately. Until I show them I’m not completely ignorant – then they’re usually pretty friendly toward me. Know a good forum for that info? Glad to hear everything worked out for you. Duct work is a different animal and something I have shy’d away from for my career – at least the installation part. Good duct work can make a difference and my only advice is this – make sure it is sized properly for the CFM load, make sure all the joints have been properly attached and secured with screws or panduit straps, make sure all the joints are sealed with duct sealer (goes on like a paste but drys and seals any leaks), and then make sure everything is insulated (including the boots) and that the insulation is sealed. That is important because if the insulation does not have a vapor barrier the inside of the insulation will end up sweating in the summer and the insulation gets soggy and falls off. So the insulation really serves two purposes…………one it is an insulator and two it is supposed to provided a vapor barrier from outside air moisture which as you may know will the moisture in the air will condense on anything below the dew point and the duct work is commonly below the dew point on the summer. Many times the old duct work is still good it just needs to be resealed and re-insulated. The best type of duct work is round hard sheet metal duct work. Installed properly it provides the best air flow with the lowest turbulence (inside the duct). lastly, make sure the duct work is supported properly. Good luck! I have a new Carrier Infinity System with 2 speed fan. The current thermostat has a battery and is wired with G-green, RC-redish orange, RH-red, Y-yellow and W-white. They are all on the assigned terminals for the thermostat. Also loose in the wall is a blue wire but it is not attached to anything in the thermostat. I want to install a COR thermostat so I can better control the humidity during the cooling season. The COR requires a common line for 24V power because it has no batteries. Do I use the blue wire or is there a combination from the red wire that will allow me to power the COR and take advantage of the humidity feature? The best way to approach this would be to go to the air handler and see what terminals those wires are connected to at the air handler. From your description it appears the old thermostat used batteries and had no common connected. In that case, you can use the blue wire for the common connection at the air handler and the thermostat. But first, trace it out to make sure. If it is loose in the air handler and not connected to anything then connect it to the common side of the transformer or terminal board in the air handler. Hi. I have a thermostat question. I replaced the thermostat and discovered that the Green fan wire is Not connected to anything on the air conditioner. Its an older package unit that only had a Red and Yellow wire coming out of the original thermostat to the outside unit. This made the unit run properly. Now ,with the new thermostat the blower will not run. I replaced the blower capacitor because the blower failed in the middle of the night. I installed the new thermostat because the old one was starting to go…What do i need to connect the green wire to on the outside unit. I checked incoming line voltage and its good. Thanks! you really need to call a professional to look at that as your description is not normal. Thanks a lot for this guide, I’m a new homeowner trying to understand how my thermostat are working… I’ve an AC + a gaz heater, the AC is controlled by one specific thermostat and the heat by another… But on my AC thermostat I’ve a W & Y wire both connected and going up to the AC unit… That doesn’t make any sense for me… Have ever see something like this? What could be the W wire plugged on the AC unit? One day i had a company agree to hire me cause i knew color codes, this text sure did help me learn alot. Is it required to connect the green “Fan” wire? Obviously this wire is used to run the fan in air handler when the tstat is put in fan mode. However, can the heat pump operate normally if the fan wire is not connected? In other words, does the air handler control electronics activate the fan itself, or does the tstat always run the fan motor in every mode? Normal operation, except without the green connected you can’t run fan only, of course. Depends on what you have. MiniSplits typically have a board that controls everything but a typical conventional heat pump in heat pump mode will be controlled by the thermostat. The best way to find out is to look at the schematic or by simply removing the green wire and testing it out. I have a nibco radiant heat panel (rhp) where the instructions advise to connect wires to the A(rc), B(rh), and 3(on/w), and to then connect the corresponding wires to the rhp. The rhp has connections for C, R, and W. I connected the 3 to the C, the R to the A and the W to the B, but it didn’t work. Any suggestions? Not sure without seeing a schematic diagram. I did look on their website and didn’t see any specific wiring diagram for what you are talking about here. They do have a tech hotline for to call and several videos on their website. Not sure that helps but again with a specific schematic diagram I really can’t help. I have RHP-1 and want to tie it into my nest.. similar problem. Do you get a Danfoss FH-WS with your Nibco, too? the panel works great, I just want to control it with my phone.. is it working out for you? The new thermostat has separate terminals for everything. Do I just match the air handler and separate yellow and black and move the white to W1, or make the same connections from the old thermostat to the new one? I don’t understand why there are two wires on one terminal. To be absolutely sure you need to trace out the wires to see exactly where they go in the air handler and the condenser. Y2 would be for 2 stage cooling and while it is possible you have two-stage cooling it is unlikely so I would not use that terminal unless you have determined you do have two-stage cooling. Except for that black wire everything else looks correct from the information you provided. You need to find out what that black wire is for. why don’t the thermostats come with a wiring diagram,so no technician will have a problem anymore. most new thermostats do come with a wiring diagram and include instructions for properly wiring a new thermostat. white reversing solenoid for cooling. not 100% sure exactly what you have there or why they used a cool only thermostat for heating??? Usually a thermostat for a baseboard heating system will energize a circulator pump or open a zone valve that then energizes the circulator pump. Seems to me not to be wired conventionally. In this case I recommend you call an HVAC service company to look at it as this not normal what you have explained here. Here’s my problem: I want my new upstairs radiant floor heat to be controlled by my downstairs nest, which currently controls my forced air. The upstairs radiant heat currently has a Danfoss with N, L, and S wires, nest doesn’t have any of these in its diagrams. My guess is, I don’t need to power nest, it’s already powered, so I can ignore the N and L wires. I also suspect I can run the S, signal, into the nest as the AUX wire, then Nest will see this as auxiliary and let me control it? Think this will work? Will I blow anything up? Ruin my nest? Thanks! Here’s a little more info: I have the Nibco RHP-1 and nest 2nd gen. This is a dual fuel system, per nest standards, and I think I should use the S (Signal) wire coming from my radiant heat panel and plug that into the O or B or O/B terminal at my nest.. However, nest says to call a professional because I can cause damage. Any advice here? The RHP instructions says all the thermostat does is close the dry leads to active the heat panel, can just the O or B wires do this? Also, in my old configuration, the blue wire is tapped off. When I install a new modern thermostat, do I need to connect the blue wire if there is a slot for it? I have a Tempstar air handler. I’m trying to install a new “smart” thermostat, but can’t figure out which term is the common. The handler has W, G, B/C, R, and X terminals. The X is coated, indicating they don’t want you to use it, I assume. The B/C has the Y wire attached. There are no other terminals. In this config, which would be used as the common? Also, would it be normal for there to be 2 thermostat wires connected to the same terminal, as each already has a wire, except the X? There are two sides to the transformer, the line side with high voltage one one side of the transformer and the control side which are the wires that provide the control voltage for the system. This should be 24 volts give or take a fraction or two. If you follow the wire from the R-terminal it should go directly back to the transformer. That R wire is the hot side. The other wire coming out of the same side of the transformer is the common side of the transformer. This is the wire you are looking for. Tap into that and you have solved your problem. If you are not comfortable doing this then I advise you call a professional. Wow, I can’t thank you enough. That saved me a service call. After hours on the phone with the manufacturer’s tech people, YOUR reply was the piece of the puzzle that let me fix the installation issue. Hey my AC is acting up and for some reason the condenser shuts off and the inside fan and induction fan stays running causing the house to heat up. Any suggestions I would greatly appreciate. Oh and by the way the logic board is blinking 6 times which in translation says open rollout if that means anything. Thanks. This needs the attention of an HVAC Tech. Roll out is a safety feature that is used in the heating cycle. Whenever the rollout pops it is possible something serious is going there which requires the attention of a professional to ensure there is nothing dangerous going on that would cause the roll out to pop. So I’m running air conditioner and its calling for heat? Must be a bad logic board? No, that would be making an assumption and without looking at it there really can be no definitive answer. When it comes to anything safety related, especially a gas furnace, it needs the attention of a professional as I recommended to you. The fix could be something very simple or it could something very complex. No one knows until its gone through troubleshooting. Is this 2 stage for heating or two stage for cooling? Is it a heat pump or is it just a straight air conditioner? Or is it an an air conditioner with a gas furnace for heat? It is really important to know this information. For a second stage cooling you need need a Y-2 terminal in the thermostat and it needs to be properly connected in the air handler and condenser. For second stage heating you need a W-2 terminal in the thermostat and it too needs to be properly connected in the air handler. One last note, Amana also uses a control system called Comfortnet and this means it is a communicating thermostat. This is completely different than a conventional thermostat. It communicated through a small wire to the air handler and the condenser. You can download a program and hook the thermostat up to your computer through a USB port for customization. However, I do not know what you have there Boris except your basic description of a 16 SEER 2-stage 5-ton. You can find all the information here if you have the communicating thermostat. удача Boris! Red-Red, Blue-Com, Purple-y1, yellow-y2 those are the wires in the condencer. the way the cables were connected are as followed. R to R, blue to common, now Y1 was used as green cable and is connected to Y1, then Y2 is yellow cable and connected to y2 in the air handler. i feel this is not correct how is the two stage going to kick in. I feel cool stays in first stage for ever, and my heat throws too much air… i hope you can help me, because no one cant. i was wondering do i need jumpers in order for the two stage to work… either for furnace or cooling? Boris, I just finished working on your answer. I wrote a whole article about it. Hope it solves your problem. Two-Stage Furnace Air Conditioner Thermostat Control Problem. By the Way, the S1 and S2 plugs are for an outside air temperature sensor for outside temperature display. Some thermostats also use the outside air temperature for a control point if you have a heat pump. I want to thank you, not by saying but by donating some money is there a way I can do that. Not a lot of people take their time to help others. Once I get home I will check on my thermostat and check the settings. No Boris, its okay. Just share the site on social media ie Facebook, Twitter, Reddit and others. I simply hope your problem is resolved!. At least now you understand how it works. Boris, I just updated the new article to include more information about your blower issue you mentioned. Thank you! I recently installed a new thermostat and would not have been able to do so without this resource. The instructions that came with the new tstat were not helpful because the old tstat had different terminals. Your explanation helped me figure out what went where. No problem…..your welcome!! Don’t forget to share us on social media………..we appreciate the kind comments and the sharing on social media. It helps so other people can get help also. I have a Ruud RP1560AJ1NA unit that is run by a Honeywell TH320R1003. Well technically WAS run by the Honeywell. This spring I switched out the Honeywell for a Nest and l must not have checked the heating side because now that the temps are lower, I am not getting heat. The nest only used 6 of the 8 wires that came from the unit when I hooked it up. I used only 6 because the Nest peeps said the other 2 wires (orange & black) are for an outside temp sensor. Well, I took the Nest off today because I don’t have any heat and want the Honeywell back but I can’t find the picture I took of the Honeywell wires before I removed it. No, heat and I’d love to get a little heat back. FWIW the Nest worked perfectly on air conditioning. Now I’m not sure anything is working. It’s heatpump with LPG back up or the other way around. I think you need to call for service as this seems a little out of whack for the wiring colors. Someone who knows what they are doing needs to confirm the wiring colors at the other end where they are terminated in the air handler and the condenser. You have a heat pump with LP back up heat known as dual fuel. This problem does not necessarily mean the problem of no heat was because the NEST was wired wrong but it could be something wrong with the heat pump itself. With the NEST wiring you had no control for the reversing valve which is most likely the orange wire (don’t take my word for it…………..it needs to be confirmed absolutely at the termination point). In Rheem and Ruud the reversing valve energizes in heat mode (as noted above). It is likely the orange wire but I have seen others use the blue wire in Rheem and Ruuds. This is why I told you the wire colors need to be absolutely determined correct by someone who knows what they are looking at lest you blow a transformer. Not sure the NEST has a jumper inside the thermostat but the RH or RC or R needs power and with the red terminated at RC you only had the cooling side powered. So from my perspective based on the information you provided it was definitely wired wrong (NEST). Additionally, whenever you change out a thermostat all modes of operation should be tested before considering it a job well done. Lastly, the outside air temperature sensor needs to have two wires terminated at S1 and S2 and are dedicated directly to a thermistor located outside somewhere. With Honeywell, depending on how it is set up in the program, this temperature sensor could be read only and have no control functions what-so-ever. If it is set up for control then it will turn the condenser off when the outdoor ambient temperature is below the programmed set point and you will run exclusively on LP gas heat. Thank you, you have been a lot of help! I would like to replace it with a Honeywell WiFi system that requires “normal” wiring. Is this possible? I looked inside the furnace and the thermostat connections are corresponding with a small section on the motherboard…however, just to the right of that, I see the “normal” wiring letters on a different section of the motherboard. Would it make sense just to disconnect the “communicating” port and go straight to the other port on the motherboard? Or is it more complicated than that? Yes, it is possible however I recommend you get a knowledgeable Lennox tech to do it because it may require some settings changes on the board dip switches. Additionally, the existing wire you are talking about will not work on the Honeywell thermostat. Hopefully, the conventional wiring is still there and they did not cut it out when they installed the communicating tstat wiring. I’ve seen installers remove the old wiring before or in new construction it was never installed in the first place. It is why I recommend on my reviews pages that if you select the new communicating feature (with a new HVAC system) that they leave the existing wiring in place in case you want to revert to a conventional system. It depends on what you have for an HVAC system but heat pumps generally require more wires than a gas furnace AC combo. You can read all about tstat wiring here. I want to install a new Honeywell Lyric T6 and need a common wire to power the unit. When I trace the thermostat wires back to my Goodman high efficiency furnace (2012) it appears that the red and green wires are connected normally, but the 2 wires from the AC compressor are attached to the white (aux) terminal in the furnace and the yellow terminal of the thermostat. The yellow terminal on the furnace circuit board is not being used. I also have a humidifier connected to the the white and common terminals. Can I switch the AC compressor from the white to the yellow terminal? Should the humidifier be attached to the green terminal? Thanks. Sorry, I cannot advise you on this. You are descriptive but without seeing it for myself I cannot advise you. Send some detailed photos using our upload feature. I saw the pics you sent. I’ not telling you how to wire it because honestly, if I was you, I would call a pro to do this. However, if it was me, I would take that blue wire you see that’s wrapped around the bundle in the thermostat sub-base pic, and use that wire for common. In other words, control board (air handler) that blue wire should be un-used the same as it is un-used at the sub-base. Attach that wire to the C terminal at both the new thermostat and the control board. And if the humidifier is working fine along with the condensing unit I would not touch any of the other wiring. Thanks. That was my thought also, leave well enough alone. I connected the blue wire to common and left the others as is with the new thermostat. Since it was a mild day (68 F) I tested both heat and cool. Both worked so it should be good to go. I have a comfortnet 2 stage cooling (not sure about heat) system. My current thermostat only has 4 wires (power, common, 1, and 2 with 1 being cool or heat and 2 being the other I think). There is no fan wire. If I install a smart thermostat (with no fan wire), would the fan be controlled by the air handler? Or is there a special communication going on that the comfortnet thermostat interprets and controls the fan? Any idea of the functionality I might lose by doing this? The communicating thermostat uses computer speak to communicate back and forth to the air handler and the condenser. If you are going to install a new smart thermostat you will need to run additional wires for that. To do that you need to know what you have for heating. If you have a two-stage furnace with a two stage air conditioner then you need extra wires for that (as described in the article above for staging) plus you need a common wire. So you need to either run new conventional wire (18-gauge copper solid in a multiple bundle) or keep what you have. This is why I recommend to people, when they select the communicating thermostats when they buy a new system, to make sure the contractor leaves the conventional wiring in the wall. That is in case you decide to switch to a digital thermostat the wires are available. And the fan will not work in cooling. You need the G terminal functionality for that. In heat the fan will work as it is usually based on a timer in the control board in the furnace. (assuming you have a furnace)So recapping, you need to pull new wire to make it work. Check out our page on running new thermostat wiring for tips. You will find it on the thermostat menu or in the thermostat category. Thanks for the quick response. Your answer is the most detailed info I’ve been able to find. It seems that comfortnet really keeps the details of their systems under lock and key. So, theoretically, the additional wires should make the unit functional, just maybe at a cost of variable fan speed control from the thermostat. Is that correct? Would any other features (like the two stage compressor) that would be negatively affected? No, the fan speed control is typically handled by a control board in the air handler but in cooling the G circuit needs to be completed so it knows it is in the cooling mode. In heating mode, the control board typically handles the fan speed entirely without the G circuit being completed. Heating has a different control than the cooling in most systems and the reason is for humidity control. You want to dehumidify more in the summer when the humidity is higher. The less humidity in the air the cooler you will feel. Trane calls it the Comfort R and other manufacturers call it something different. I have a thirty yr. old intertherm thermostat I would like to change to a honeywell programable TH 4210d1005. the intertherm has more wires and different lettering then the Honeywell I have a 2heat 1 cool system/w heat pump. the wiring in the intertherm is:W2 brown,X pink,Z orange, T black, W1 white, Y yellow,K blue, R red, G green Can you tell me how to wire the honeywell with this info. this is in a manufactured home. the model no. for the furnace is MSH-o65-AA-o3 and model no. for the heat pump is PCSB -030K(911262). This an oil furnace. The Honeywell does have em heat setting. It took over ten web searches to finally land on your AWESOME webpage! Since I didn’t have such great information yesterday, I proceeded to install a new Emerson Series 80 programmable thermostat on our Goodman heat pump system. The Goodman is three years old and was installed with a Braeburn standard thermostat. The Braeburn had a separate slot for O (orange) and B (blue). The new Emerson has O/B on one slot. In my haste I put both the blue wire and the orange wire into this slot. Ran a test, nothing worked. Then put the blue wire into the C slot but still nothing is running. Could putting both orange and blue together blow something out? Breaker was off until the test phase. I’m about to reinstall the old unit just to make sure it still works. Thank you very much for your response. The answer to your question is yes. Putting them together could have blown a fuse or even the transformer if it didn’t have fuse protection. If you have a fuse on the system it is either near the transformer or a low voltage/amp fuse on the circuit board. Some circuit boards don’t have fuses. The solution to your problem is to trace all the wires out to make sure they are terminated properly at the thermostat. You have to go to the air handler, kill the power, open the panel, and find out which wires go where. You are likely okay with the standard colors like Yellow, Red, Green, and White. It is the blue and the orange wire you need to figure out. I am guessing with a Goodman, the blue wire will be common and the orange wire will be the reversing valve if you have a heat pump. Some people think they have one type of system but they really have another. Not saying you don’t know just saying from my experience. I get calls from people telling me their furnace is broken and when I get there they have a boiler. Anyhow, hope you figure it out. This leaves 3 connections from the Carrier that I can’t place on the new Honeywell…S1, S2 and HUM. Any suggestions? The available slots on the Honeywell are K, Rc, Y and L. Are the above configurations correct? Can’t really say the connections are absolutely correct without looking at the system and verifying the terminations at the air handler. The S1 and S2 are attached to an outdoor air temperature sensor. The HUM is for a humidifier as the current thermostat is also a thermidistat or a humidistat/thermostat combined. You have a few options if you really want to do this but I don’t recommend it. You can buy a humidistat and mount it somewhere near the thermostat. A humidifier helps in the winter and can save you money so I don’t recommend abandoning it but that is an option. The outside air temperature can be done by the new Honeywell over WiFi pulling the local temperature and using that for display and sometimes control depending on the type of system you have. Honestly, I recommend that you call a professional to do this properly mainly for the humidifier problem. With the new WiFi thermostat, the S1 and S2 wires can be abandoned. I would not cut them off completely but rather tape them to the thermostat wire in case you want to switch back in the future. If you do switch back and the outdoor air temperature sensor is more than ten years old I would test it for calibration to make sure it is accurate. It seems like you have staging there which can be a lot more efficient with control algorithms in the thermostat that are dependent on an outside air temperature reference. This can get complex (especially when the word algorithm is used) but the control is much more precise when it is done properly and in the long run that will save you money. Hi, I currently have a Honeywell RTH2410 thermostat, and I can’t figure out a particular wire. I have a heatpump with heat strips for 2nd stage heating. Right now, my thermostat has an orange wire in O, a green wire in G, a yellow wire in Y, a red wire in R, a blue wire taped off, and BOTH a black and white wire in W/Aux. B and RC have no wires. I cannot figure out this black wire. I think maybe it is being used as the common wire, as there is no C terminal on this thermostat. Any ideas? It looks like the white and the black wire are your electric heat strips and are terminated in the same place. It is not uncommon for it to be wired this way but unless the air handler uses a sequencer or control board to stage the electric heat then the electric heat is energized all at one time. I sure there are sequencers to control the staging though. To make this work through a thermostat you need a thermostat that has a W-2 termination. Your thermostat does not have that terminal. And to really find out the mysterious black wire you have to trace it to the air handler but be very careful because it contains high voltage and really should only be looked at by someone who has training and knows what they are looking at. And by the way, if it was a common wire it would blow a fuse or transformer when the W terminal energized. The thermostat is battery powered rather than powered from the control transformer. There is no C because of that. I’m trying to determine if I’m compatible with Nest E, which does not have W-2, and does not have Aux, and only has W-1. Seems like the answer is no. 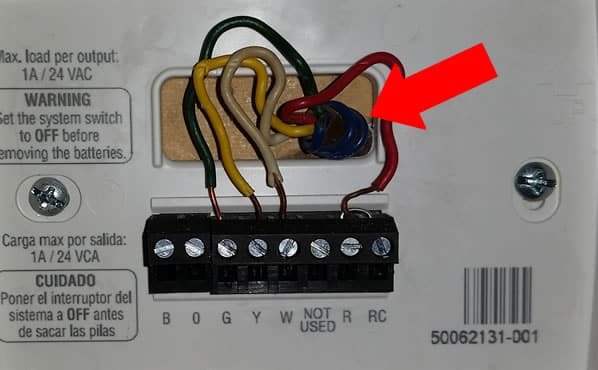 Assuming the black and white wires are properly traced, is it likely the white wire goes to W for heating, and the black wire goes to Aux or W-2? didn’t finish my sentence above. I meant it seems like white is for heating, whereas black is for Aux. The only real way to determine where the black goes is to trace it out. Can’t say too much about the NEST so you will have to refer to them for more details. I think their intentions are great but have read and heard a lot of negative things about NEST and their sub-bases in the HVAC community. Green… fan like a SPRING BREEZE… this is the FAN/Blower wire. White… When HEATed… things get WHITE HOT… heating. Yellow… watch out where the huskies go and don’t you eat that YELLOW Snow.. Snow is cold.. Cooling. Red… just like a car or any DC circuit EVEN THOUGH IS IS 24 VOLTS… Supply side of the 24 VAC transformer. Black or possibly Blue… the Common or return side of the 24 VAC Transformer that runs the LOW voltage side of units. Orange… normally the Reversing Valve wire on Heat Pumps. Hello, I figured I would try here to see if I can find a solution. My brain is going to explode. I have been doing endless research, but nothing! I just bought this home 4 months ago when the snow was still on the ground. Before buying, the home was inspected, everything. The inspector recommended having the furnace cleaned since he noticed a few things. Long story short, they replace the furnace. Now that its finally getting hot, I turn the air on and nothing worked. I assumed the contactor was bad and replace it myself. If I now hold contactor in, it powers on. But nothing from T-Stat. I took a look at the furnace and at the board, the guy never installed the two wires coming from the Contactor (low Volt Side). If I add them to R and Y, nothing happens. R to C on Board kicks on great. Problem is it wont shut off at the T-Stat just keeps going. (forgive me for my terminology, from reading through the comments I am assuming T-Stat is short for thermostat. If not, that is what I am referring to. Also has the Letters B and O. but nothing plugged into these. Just those 4 wires and that jumper wire. Is there a work around, or simple solution I’m missing here? Thank you so much and look forward to hearing back! OUTSTANDING!!!!!! Thank you so much for your speedy response!! I have AC Now my friend! So I changed my old Honeywell thermostat to a digital one a few months ago which works fine. I’m wanting to change to a smart thermostat, but when I went to look at the HVAC unit since I need the Ecobee PEK adapter the wiring confused me. From when I originally took out the old thermostat, it had Y,W,G,R wires. When I went down to the HVAC unit just now to make sure everything lined up it didn’t have the Y wire going to the Y receptacle, but instead it was connected to the C receptacle and nothing connected to the Y? Any idea why or what this means? The Y wire is running out to the condenser for the compressor contactor. Its normal for it to be that way. Thank you for the reply! So am I able to to use the smart thermostat with the PEK adapter, or since the C receptacle is already taken will it not work? No, the C terminal can be used for the thermostat as well as the condenser (shared common). Simply add a wire under the C terminal in the air handler. C is the opposite side of R coming from the transformer and is needed for a complete circuit. The C side of the transformer is attached to every single load on the control side of your HVAC system so having more than one wire on the C terminal makes no difference. The only difference it would make is if you exceeded the VA rating of the transformer and in this case, that is very unlikely. Hopefully, you have an extra wire running to the thermostat as you will need five wires to make the Ecobee work. I have an Ecobee4 and it works great. When I installed it replaced an old mechanical type of thermostat that needed only 4 wires. When I took the old thermostat off the wall I pulled all the wires out and discovered there was an unused wire in the bundle. At the air handler, I attached that wire to common (the same going to the condenser) and at the other end, I attached it to the C terminal in the Ecobee4 subbase. I could have used the PEK adapter but I would rather have the common wire attached and the system working with that. I travel a lot and can turn things on and off from afar. It’s fantastic to have remote control and monitoring. It also saves money because I do not have to run the HVAC system except when the temperatures are extreme. They also have a proximity feature that works off the app on my phone. When I am within a certain distance from the house it turns it off automatically when I travel outside of that radius and turns everything back on when travel inside of that radius. It is common for installers to run extra wiring in the bundle. You need 7 wires (from your description) but the bundle has 8 wires. It is simply a spare wire in the bundle. Wrap it around the bundle and wire as instructed. If in the future you have issues you will have an extra wire. Hopefully, you will not need 2 extra wires if a problem were to occur. I would love to help you right now, however, I am extremely busy. In the near future, I will devote an entire article to this system (Honeywell TrueZone) and its operation. This is a layered control system where Honeywell controls some things while Trane controls other things. There are also several different settings, usually done by dip switches that will control various things including ramping the blower. And variable speed blowers can be tricky because they are so quiet. I cannot make a promise as to when but I will get to it soon. In the meantime, I would recommend you call an authorized Trane dealer, ask them if they have technicians who are familiar with your type of system. If so, then have them come out and give the system a once over check. Personally, if it was my house, I would go with several smaller systems over one big zoned system. Residential zoning, at least these types of systems, have not been perfected enough as compared to commercial systems. I’m talking about precision control for temperature and airflow. Sorry, I can’t help you at this time but firstly, as stated, I am extremely busy right now and secondly, this is a complex system that requires time to devote to details.